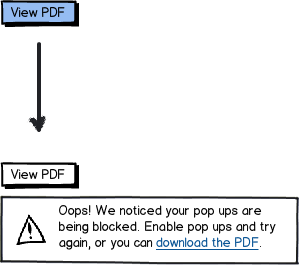 I'm facing a problem where I need to check if the user has pop ups enabled when they try to view a pdf file in their browser and for this I would need to open a tab and close it real quick, there's no other way to check this and if they are disabled I would give them a warning message to enable them for the application and right after this a second tab with the pdf will open. The developer tells me this would happen only one time since they are able to cache this information it shouldn't be that big of a problem, but my concern comes from the standpoint of what happens if the user uses another device or they clear their cache. My approach to this would be by giving the user a warning no matter what about making sure they have pop ups enable or that they don't have any pop up blocker extension enabled like ad block, only one time of course, similar to what the developer is trying to do with the cache. I think popping up a window and closing it really fast would look extremely suspicious to a user that happened to notice it. I would very quickly abandon a site that began doing that—no telling what kind of malware could be infecting that site/my computer. Instead of messing with trying to detect it before the fact, just focus on recovery. Make it easy for the user to know what's going on and how to fix it. If you detect that the PDF did not open successfully, then notify your user, and and provide an alternative to the popup. Additionally browsers and popup blockers will typically let the user know when they've blocked something, and often provide an easy way to open the blocked popup, so the user could solve this on their own. Not the answer you're looking for? Browse other questions tagged popup browser help app or ask your own question.